The Pink Dogwood (Cornus florida rubra) is a small ornamental tree with four season appeal. It would look great in your yard as an understory tree by a larger planting, or planted along a woods or border. The Pink Dogwood is the state flower of North Carolina, and for good reason. Every season will bring you something new to admire and enjoy. Your Dogwood will begin to bloom when it’s only 4-6 feet tall so you won’t even have to wait. 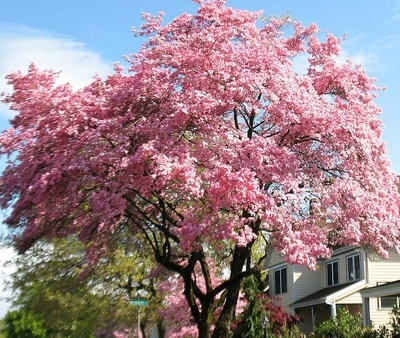 It’s so anxious for summer that the 4-peteled pink blossoms will spring into life before the tree has even leafed out. In the summer distinctive oval, curved leaves will appear. Birds will flock to your tree for the tasty, glossy red berries later in the summer. For autumn your Dogwood will drape itself in pinks and reds in a dazzling fall display. Just when you think the show is over, winter will reveal the underappreciated characteristic of the Dogwood. Heads will turn at the sight of the unusual bark as it’s fully exposed in all its uniquely mottled, rough glory. You might think that such a beautiful tree would require special care, but not so with the Pink Dogwood. Your Dogwood will grow in almost any soil conditions and even tolerate other plants close by. In fact, it even prefers a little shade. The Dogwood can grow up to 30 feet with a 25 foot spread. It has horizontal growth on the lower half of the tree and upright branching on the top half, forming a round crown. This unusual growth pattern produces a graceful, flowing shape that will naturally draws the eye to its unique form in your landscape. The Pink Dogwood certainly has something to recommend it in every season, and it will look terrific in your yard year round. Currently shipping 6-12'' ships bare root.